My girls are fussy eaters. They are very picky about what they will and will not eat and it’s hit or miss whether they will eat what I buy. I am not talking about my daughters here even though they are my girls too. I am talking about my two cats- Misty and Princess! Misty and Princess are sisters and do everything together. They both have rejected the cat food I bought in the past and even some treats! It’s always a game of chance when I try them out on a new food because I worry about wasting my money if they won’t eat it. I was very intrigued when I learned about Royal Canin and their new Selective line of Cat Food and wondered if Misty and Princess would like it. Cats are very different than people when it comes to determining food preference. Their sense of taste is the least developed of all the senses so the actual flavour of the food is not the most important factor when a cat decides what it wants to eat. In fact, they base their choice on other factors like aroma, texture and the feeling of satisfaction they get when they eat the food. Each cat will decide which of the factor is their most important. It’s pretty much up to your cat to decide which one they value the most. Aromatic Attraction– for cats who are attracted the most to the smell of the food. Savour Sensation– for cats that value the shape and feel of the food in their mouth the most. 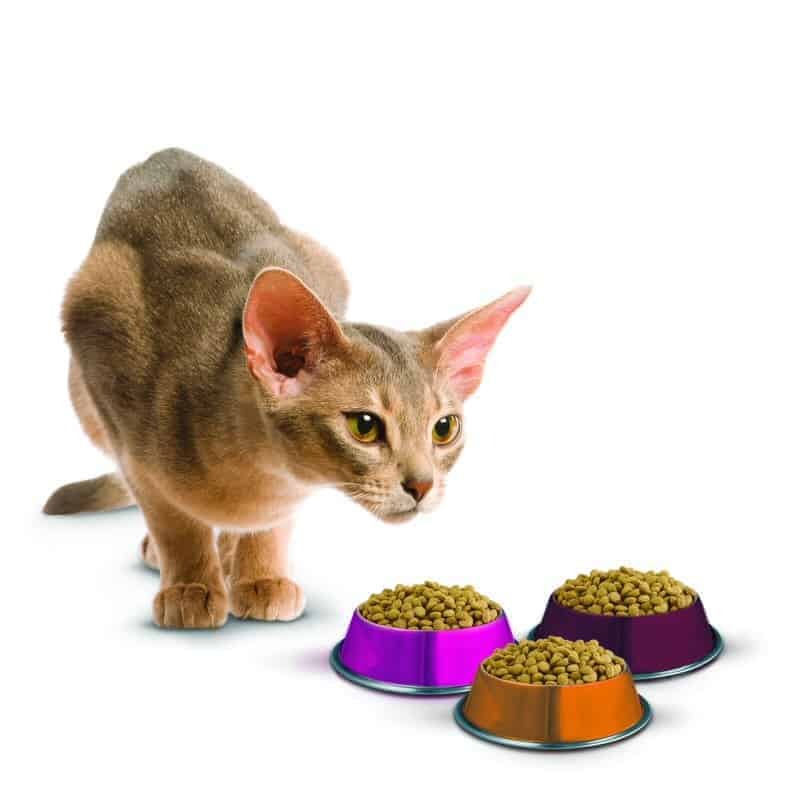 Protein Preference– for cats that enjoy the feeling of satisfaction and fullness after they eat. Now you might be thinking that you would have to buy all three bags of cat food and try each on your cat. That’s not the case. 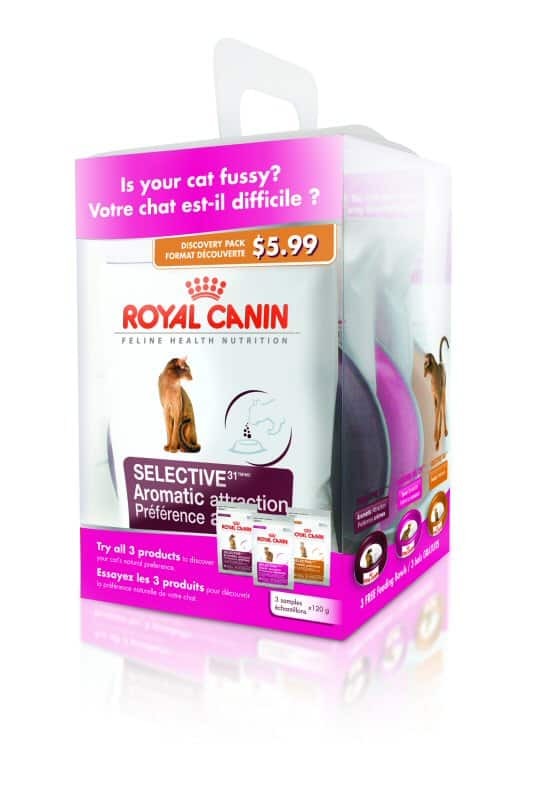 Royal Canin has a Discovery Pack that gives you a sample pack of each of the Selective Line so you can try out on your cat and determine their natural preference. They are colour coded and come with 3 bowls and info and a coupon to use when you buy the bigger bag of the food after your cat makes its choice. I was sent two Discovery Packs to try out on Misty and Princess. I separated them at the first feeding so that Misty would not be influenced by Princess or the other way around. I wanted to see what bowl they gravitated towards. Then I let them eat together like that have been doing since I got them and they still went to their preferred food. I have it all on video too and it’s actually part of the Royal Canin Social Media Release! Pretty cool eh? As you can see from the video, Princess liked the Aromatic Attraction and Misty liked the Protein Preference. I found the Discovery Pack so helpful! I know what each cat prefers so when I go shopping, I can buy food that I know they will eat. I do want to mention that I left the bowls out all day and by morning, they were all eaten. I know that they did eventually eat the Savour Sensation, but it was neither cat’s first choice. It was a really fun process- kind of like an experiment with my cats! The Selective line for cats is now available in pet stores across Canada, including Pet Valu, Global Pet Foods, Petcetera, Mondou, and several other independent pet stores. The Discovery Pack is available for purchase at a suggested price of $5.99, while bags of Aromatic Attraction, Savor Sensation, and Protein Preference range from $18.99 to $35.99. Check out this new line next time you are at the Pet Store and try out the Discovery Pack on your cats. It would also make a nice gift for a cat lover! Facebook & Blog Giveaways | What is Allowed? Well… I would give this to any of my cats… Farley, Magoo, Gizmo, Mousey or FeFe…. okay, they aren’t all mine.. between us and my Dad!!! 🙂 It will be well used regardless! OOH AND I LIVE IN BC!! SORRY FORGOT TO PUT THAT IN BEFORE!